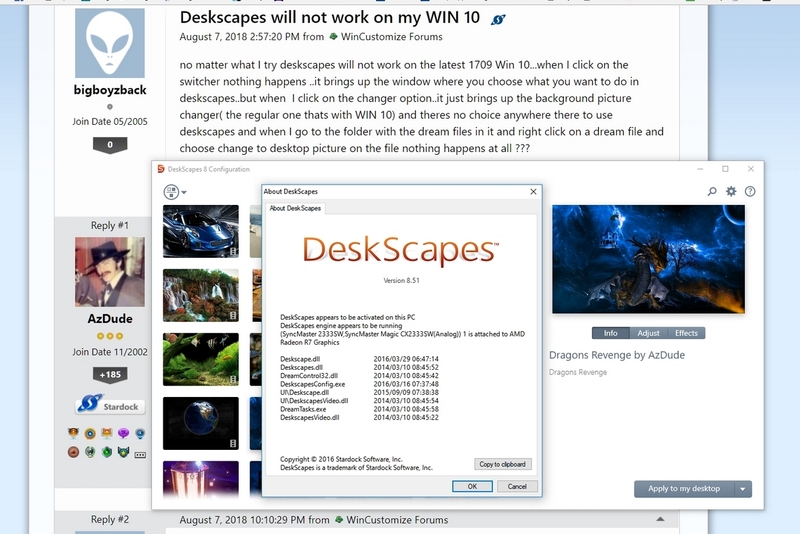 no matter what I try deskscapes will not work on the latest 1709 Win 10...when I click on the switcher nothing happens ..it brings up the window where you choose what you want to do in deskscapes..but when I click on the changer option..it just brings up the background picture changer( the regular one thats with WIN 10) and theres no choice anywhere there to use deskscapes and when I go to the folder with the dream files in it and right click on a dream file and choose change to desktop picture on the file nothing happens at all ??? I tried installing it back when I had the 1607 Win 10 build and now with the newest 1709 Build and it never worked...both times I went to the stardock website and download the latest version of it...I wonder if it has anything to do with the fact that I already use windowblinds 10 too? 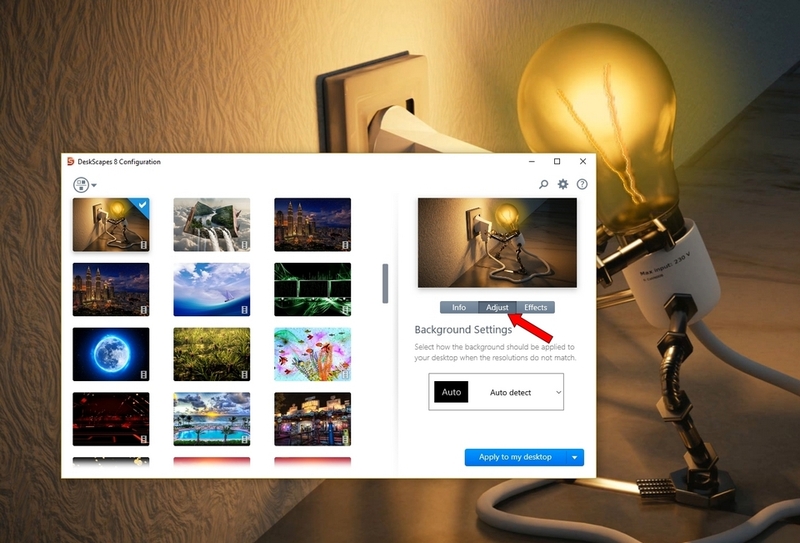 ?..but I just use a normal background picture.. I did all that you told me to but still nothing ..but I did notice that when I went to activate the product..it said something went wrong and I would have to activate it thru email..so I did that tonight...I wonder if thats why it still wont work? ?..the product isnt activated yet??? let me ask you this?? 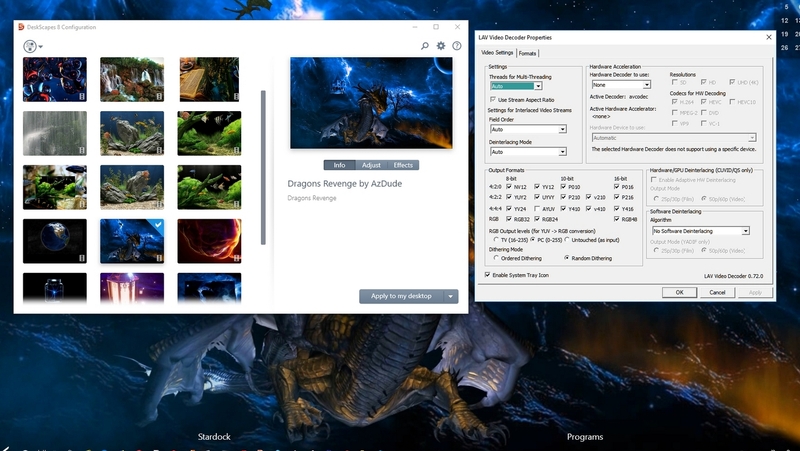 when you bring up the APP and you click on changing the dreamscapes picture and it brings up the WIN 10 background picture panel..where are you supposed to see the dreamscapes APP in that window..where should it appear there..
your product Key , see below ..
You say you did a uninstall and reinstall , BUT did you ACTUALLY do the PURGE and try a CLEAN BOOT ? a Purge is different than a regular uninstall !! and a Clean Boot allows to to open the program with no interference from other programs !! then click apply to my desktop to run the actual dream. Since the problem of the OP has been answered, I thought it would be fitting to ask here, instead of creating a new thread. Are there any known problems with Win 10 v1809 (October Update)? I can't get it to run at all with my 2 screens. I purged the installation, updated the flv filters and reinstalled, but still a black screen instead of my dreamscenes. Not using 1809 yet but good to have your codecs up to date . 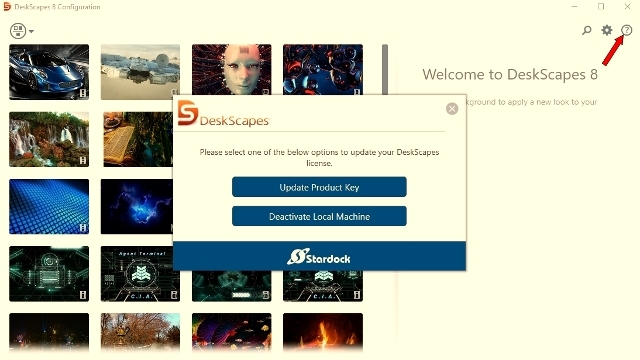 Does Deskscapes run on one screen OK ? What resolution are you running on each screen ? report back here , please. 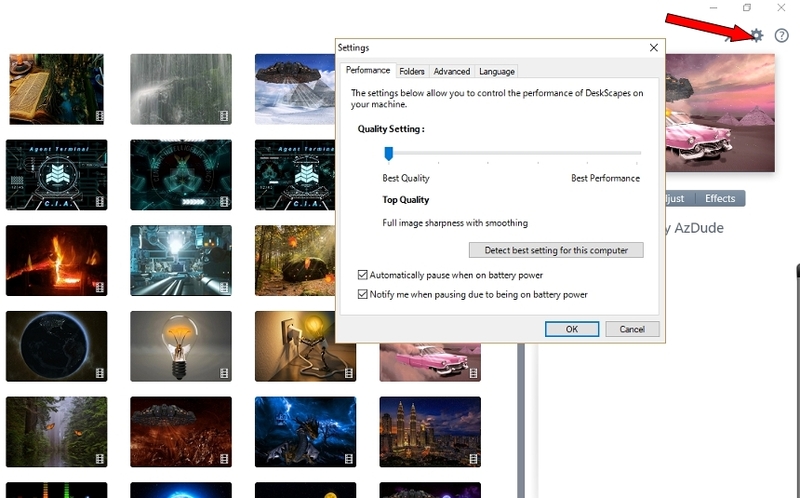 Right now, there is a known issue with DS and the Win10 October update. If two monitors are not the same resolution, there may be issues. If you set them to the same, it should be fine. We are looking into the issue and will announce any resolution. I am always using k-lite standard for updating my codecs, but also tried to update the LAV decoders, after it had been suggested here. It doesn't run at all, no matter whether I check only one or two screens. One of my screens has 1920x1080p and the other one has a 1680x1050px resolution. Right now, there is a known issue with DS and the Win10 October update. If two monitors are not the same resolution, there may be issues. If you se them to the same, it should be fine. Is there a solution yet? New year, new luck, maybe? Missing my dreamscapes on my Win 10 1809 PCs. Btw: happy new year folks. of dreams I am uploading and running. With multi Monitors know issue is still being looked into. and then make res. change after some say that works . All will be notified when a solution is available . We had an issue, for a spell, with DS upgrade purchases not giving out keys properly. It was fixed some time ago but some we still need to add manually when they are seen. I have done so for you now. Sorry for the trouble and delay, bigboyzback.